Are you a musician or a music lover? The James J. Whalen Center for Music is perfectly designed to promote the success of musicians. It is also host to 300+ recitals, concerts, and special guest performances each year. Since its founding as a conservatory in 1892, the Ithaca College School of Music has built a reputation as one of the finest music schools in the nation. Teaching undergraduate musicians is our primary focus. All faculty based in the James J. Whalen Center for Music maintain private studios for student lessons and for their own work. Through weekly private lessons, repertoire classes, and more than 300 concerts per year, students have the opportunity to study, practice, and perform. 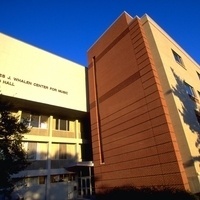 The Whalen Center features over 80 practice rooms and 182 pianos. Students, faculty, and an array of guests perform in the center’s three performance halls: Ford Hall is a 735-seat concert hall ideally suited for symphonic and choral productions; the Hockett Family Recital Hall was especially built to accommodate chamber music ensembles; and the Nabenhauer Recital Room offers a more intimate performance space. Our state-of-the-art facilities also include a music education resource room, smart classrooms, an electroacoustic music studio, and sound recording technology studios. Web streaming technology has recently been added to all major rehearsal and performance halls.